Picture a Day - The Holy Land Revealed: Mystery Photograph: Can You Identify Where this 100+ Year Old Picture Was Taken? Do You Have a Photo of the Location Today? Mystery Photograph: Can You Identify Where this 100+ Year Old Picture Was Taken? Do You Have a Photo of the Location Today? There was a 'chan' on the way to jerusalem. This is the 'chan' in shaar hagai. 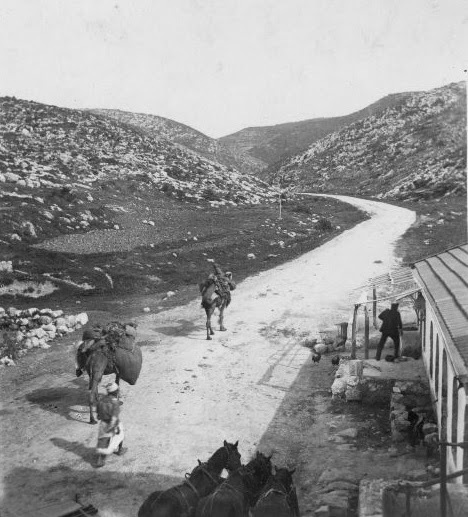 Bab el wad שער הגיא on the way to jerusalem. My guess is Judean Hills (because of the color of the stones) maybe Sha'ar Hagai to Jerusalem or Jerusalem to Jerico. Is the answer the enterence of modern Jeresulem? To the right is har nof? I love your blog thank-you shabbat shallom and chag somayach. It seems to be at Sha'ar HaGai, right where the gas station and the stone structure is today.